The Making of a Comic Con…or how I nearly gave myself a coronary! 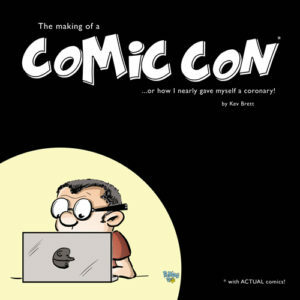 is a biographical and humorous comic based on Kev Brett’s life as he takes on the challenge of putting on his first comic convention. 24 full colour pages of funny and cringeworthy episodes. If you want to put on your own event, please read this first! The Making of a Comic Con has been doing quietly well and I’ve had some really nice reviews. One is from the Very awesome Tony Esmond over on the Down the Tubes website – a place of comic info and reviews. I was fortunate enough to be asked 5 questions on a new feature on the True Beleivers Comic Festival website as well, please check it out. You can still get hold of a copy of the book for only £3 – click here to see what it’s really like to put on a Comic Convention.